A liquid Malo-lactic culture that contains a blend of ER1A and Ey2d malo-lactic cultures suitable for a fermentation pH of 2.9 or above and temperatures as low as 55F (13C). Good for 5 gallons of wine. 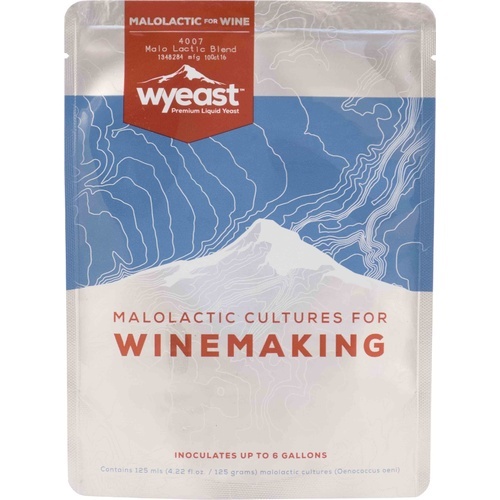 Notes from Wyeast: Fresh liquid cultures of L. oenos ER1A and EY2D provide rapid and complete malic acid to lactic acid reduction to balance and soften wines. ER1A and EY2D perform well in conditions of low pH and cool cellaring. Typical conditions of high wine acidity can be improved by reducing the harsh, sharp malic acid in the wine to the softer and smoother lactic acid. Other flavor improvements including vanilla and buttery notes can be anticipated. Natural occurring malic acid bacteria on fruit may be of inferior quality or quantity to complete malo-lactic fermentation. Vinter's ChoiceTM malo-lactic cultures are suitable of pH 2.9 or greater and cellar temperatures as low as 55°F. The performance of two strains of Leuconostoc oenos, Er1a and Ey2d, isolated from Oregon wines was evaluated in experimentally and commercially produced wines. Experimental lots of Chardonnay, Pinot Blanc, and Pinot Noir were inoculated at the end of yeast fermentation at 18°C with approximately 106 cfu/ml of Er1a, Ey2d, ML-34, PSU-1, MLT-kli, and BB44-40. Under low pH conditions, the Oregon strains completed MALOLACTIC fermentations (MLF) more rapidly than the other commercially available strains: at pH less than 3.3 Er1a completed MLF in an average of 48 days, Ey2d in 94 days, MLT-kli in 127 days, and the other strains in 143 days or longer. At pH greater than 3.4 all the strains completed MLF within 31 days. Commercial wines were inoculated during yeast fermentations with 0.5 to 2.0% V/V Er1a and Ey2d grape juice cultures (109 cfu/ml) and wine cultures (108 cfu/ml). Er1a completed MLF in 1-2 months at cellar temperatures of 15°C or higher, but was sensitive to cooler temperatures. Ey2d was more cold tolerant and completed MLF in 2-3 months at temperatures in 12-15°C. In addition, Ey2d retained MALOLACTIC activity at temperatures as high as 80°C when all other strains including Er1a were inactive. Click here for a PDF of the MoreWine Manual on Malolactic fementation. Has always worked for me in the past! Will doing MLF with some wines Iâ€™m making. We've had consistently good results with this product when used on a variety of dark red juice. The apples I'm using to make cider are too acidic. Need to experiment to reduce acidity. Is the packaging good enough for International Shipping without Ice Pack? BEST ANSWER: Hello Kyaw - Wyeast's packaging is extremely sturdy as these are intended to puff up without exploding. It should be fine for Intl. shipping without ice, however may require some propagation to regain vitality. So far so good and it’s serving its intended purpose.